The 30th Infantry Division was a unit of the Army National Guard in World War I and World War II. It was nicknamed the "Old Hickory" division, in honor of President Andrew Jackson. The Germans nicknamed this division "Roosevelt's SS". The 30th Infantry Division was regarded by S.L.A. Marshall as the number one infantry division in the European Theater of Operations (ETO), involved in 282 days of intense combat over a period from June 1944 through April 1945. The division was originally activated as the 9th Division (drawing units from North Carolina, South Carolina, Virginia and Tennessee) under a 1917 force plan, but changed designation to the 30th Division after the American entry into World War I in April 1917. It was formally activated under its new title in October 1917, as an Army National Guard division from North Carolina, South Carolina, Georgia, and Tennessee. In May 1918 the division was sent to Europe and arrived in England, where it departed for the Western Front soon after. The division, along with the 27th Division, was assigned to the U.S. II Corps but did not serve with the main American Expeditionary Force (AEF) and was instead attached to the Second Army of the British Expeditionary Force (BEF), trading American equipment for British equipment. The major operations the 30th Division took part in were the Ypres-Lys, and the Somme offensive, in which it was one of the two American divisions to break the Hindenburg Line in the Battle of St. Quentin Canal. The division had, in three months, from July until October 1918, sustained 1,237 officers and men killed in action (KIA), with a further 7,178 wounded in action (WIA) or missing in action (MIA). Awards: MH-6 ; DSC-50 ; DSM-1 ; SS-1,773 ; LM-12; DFC-3 ; SM-30 ; BSM-6,616 ; AM-154. After training in the United States for just over two years, the 30th Infantry Division, under the command of Major General Leland Hobbs, arrived in England, 22 February 1944, and trained for the Allied invasion of Normandy until June. It landed at Omaha Beach, Normandy, on 11 June 1944, five days after the initial D-Day landings of 6 June 1944, secured the Vire-et-Taute Canal, crossed the Vire River on 7 July. Beginning on 25 July, the 30th Division spearheaded the Saint-Lô break-through of Operation Cobra, which was intended to break out of the Normandy beachhead, thus ending the stalemate that had occurred. During the operation, on both 24 and 25 July, the 30th Division encountered a devastating friendly fire incident. As part of the effort to break out of the Normandy hedgerows, US Army Air Force (USAAF) bombers from England were sent to carpet bomb a one-by-three mile corridor of the German defenses opposite the American line. However, USAAF planners, in complete disregard or lack of understanding of their role in supporting the ground attack, loaded the heavy B-24 Liberator and B-17 Flying Fortress bombers with 500-pound bombs, destroying roads and bridges and complicating movement through the corridor, instead of lighter 100-pound bombs intended as antipersonnel devices against German defenders. Air planners switched the approach of attack by 90 degrees without informing ground commanders, thus a landmark road to guide the bombers to the bombing zone was miscommunicated as the point to begin the bombing run. Start point confusion was further compounded by red smoke signals that suddenly blew in the wrong direction, and bombs began falling on the heads of the American soldiers. There were over 100 friendly fire casualties over the two days, including Lieutenant General Lesley J. McNair, commander of Army Ground Forces. The division relieved the veteran 1st Infantry Division near Mortain on 6 August. The German drive to Avranches began shortly after. The 30th Division clashed with the elite 1st SS Panzer Division, and fierce fighting in place with all available personnel broke out. The division frustrated enemy plans and broke the spearhead of the enemy assault in a violent struggle from 7–12 August. After the liberation of Paris, the division drove east through Belgium, crossing the Meuse River at Visé and Liège on 10 September. Elements of the division entered the Netherlands on 12 September, and Maastricht fell the next day. Moving into Germany and taking up positions along the Wurm River, the 30th Division launched its attack on the heavily defended city of Aachen on 2 October 1944, and succeeded in contacting the 1st Division on 16 October, resulting in the encirclement and takeover of Aachen. After a rest period, the 30th Division eliminated an enemy salient northeast of Aachen on 16 November, pushed through Alsdorf to the Inde River on 28 November, and then moved to rest areas. 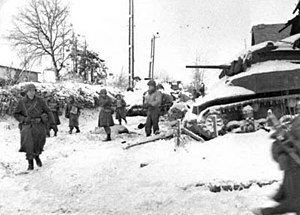 On 17 December the division rushed south to the Malmedy-Stavelot area to help block the powerful enemy drive in the Battle of the Bulge—the Germans's last attempt to win a decisive victory over the Western Allies. Again the division met the 1st SS Division, and again broke the spearhead of their assault. The 30th Division launched a counterattack on 13 January 1945 and reached a point 2 miles south of St. Vith, Belgium on 26 January, before leaving the battle and moving to an assembly area near Lierneux on 27 January, and to another near Aachen to prepare for attack deeper into the western edge of Germany at the Roer River. The Roer was crossed on 23 February 1945, near Jülich. The 30th moved back for training and rehabilitation on 3 March, and on 24 March made its assault crossing of the Rhine. It pursued the enemy across Germany, mopping up enemy pockets of resistance, took Hamelin on 7 April, Braunschweig on 12 April, and helped to reduce Magdeburg on 17 April. The Russians were contacted at Grunewald on the Elbe River. The end of World War II in Europe came soon afterwards and, after a short occupation period, the 30th Division began its return to the United States, arriving on 19 August 1945. The surrender of Japan followed soon, which brought the war to an end. 18 February 1944: XIX Corps, First Army. Following the war, the 30th Division was once again reactivated as a National Guard formation in 1947, split between three states. It included the 119th, 120th, and 121st Infantry Regiments. In 1954, the division became an entirely North Carolina Army National Guard manned formation, as Tennessee's portion became the 30th Armored Division, which was maintained with the Alabama Army National Guard. In 1968 the division was designated as the 30th Infantry Division (Mechanized). On 4 January 1974 the division was again inactivated, and the brigade in North Carolina become the 30th Infantry Brigade (Mechanized) (Separate). The 2nd Brigade, 30th Infantry Division, became the 218th Infantry Brigade (Mechanized) (Separate). ^ a b "Fact Sheet - The 30th Infantry Division Veterans of WWII". ^ Haas, Darrin. "Still Shocking". National Guard Magazine. Retrieved 11 December 2012. ^ "Chapter II: Genesis of Permanent Divisions". Archived from the original on 4 June 2008. ^ "Home Page - Indiana Military Org". ^ Featherston, Alwyn (1998). Battle for Mortain: the 30th Infantry Division Saves the Breakout August 7-12, 1944. Novato, CA: Presidio. p. 16. ISBN 0891416625. ^ Featherston, Alwyn (1998). Battle for Mortain: the 30th Infantry Division Saves the Breakout August 7-12, 1944. Novato, CA: Presidio. pp. 16–17. ISBN 0891416625. ^ Beevor, Antony (2010). Battle for Normandy. Penguin. p. 402. ISBN 978-0-241-96897-0. ^ Adjutant General of North Carolina 1961, pp. 19–21. ^ Adjutant General of North Carolina 1964, pp. 18–21, 100–101. ^ McGrath, The Brigade, 240. Adjutant General of North Carolina (1961). Report of the Adjutant General of North Carolina, 1 January 1959–31 December 1960. Raleigh: Adjutant General of North Carolina. Adjutant General of North Carolina (1964). Report of the Adjutant General of North Carolina, 1 January 1963–30 June 1964. Raleigh: Adjutant General of North Carolina. Featherston, Alwyn (1998). Battle for Mortain: the 30th Infantry Division Saves the Breakout August 7-12, 1944. Novato, CA: Presidio. ISBN 0891416625. Russell, Major General Henry D. The Purge of the Thirtieth Division. Naval Institute Press, 2014. ISBN 978-0870210662. Wikimedia Commons has media related to 30th Infantry Division (United States).